generously help The Sweetest Occasion keep the party rockin’! You guys are well aware by now that my favorite tokens of affection to give and receive for Valentine’s Day are those that are sweet and simple with a homemade touch. 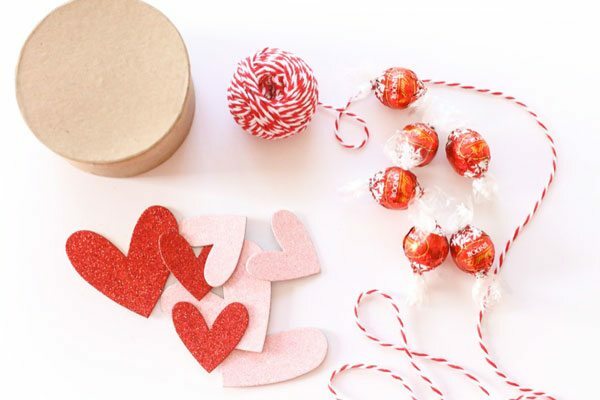 Enter today’s super easy and utterly delicious Valentine’s Day idea – DIY chocolate box valentines! 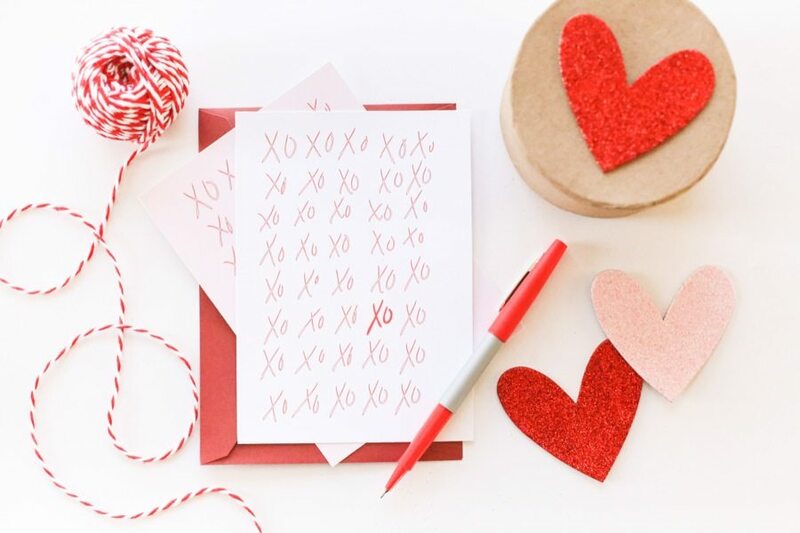 Paired with our free printable Valentine’s Day cards designed just for you by Carolynn of Two Brunettes, they’re as easy as downloading, printing, trimming and sticking in an envelope. Inspired by my favorite Lindt LINDOR milk chocolate truffles, these little babies make a great Valentine’s Day gift for everyone from your better half to your best friend to your coworker the next cubicle over. 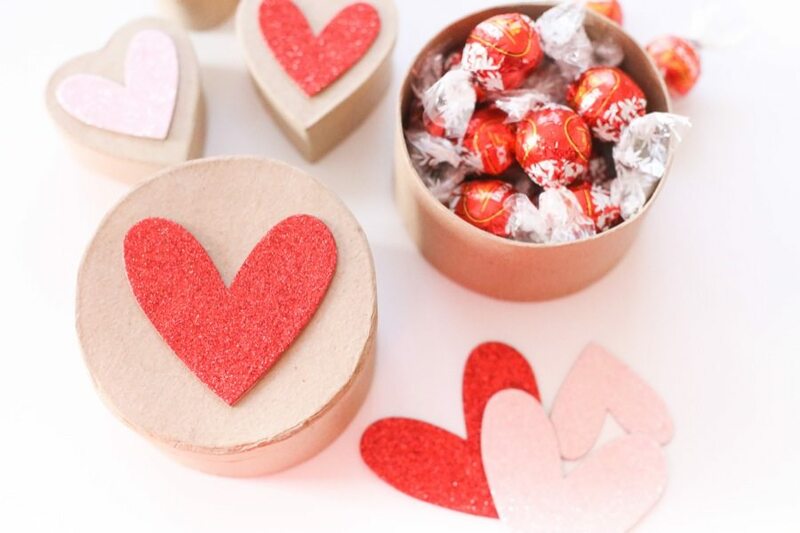 Begin by dressing up your paper maché boxes with a little heart action. I found these glitter paper heart appliqués (and the boxes) at Michaels, but you could also use a glitter paper and a heart paper punch to achieve the same thing. (You can usually find glitter papers in the scrapbook aisle of most craft stores.) 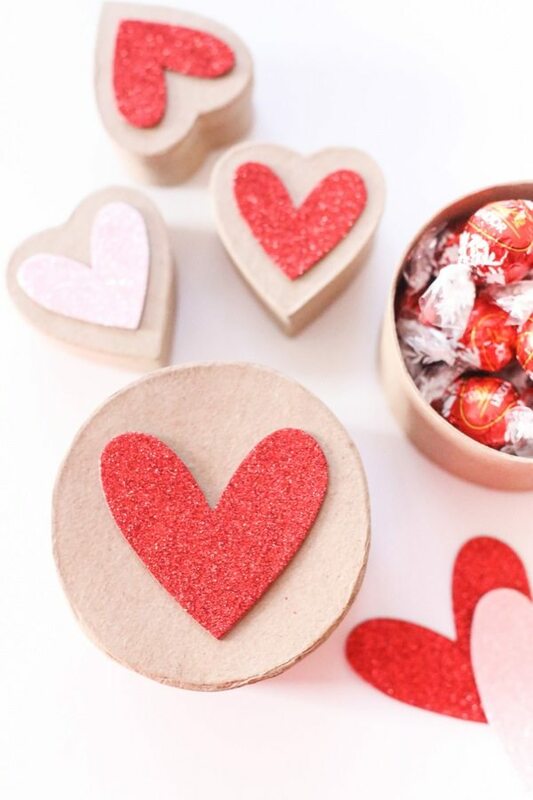 Attach a heart to the lid of each box using a simple gluestick or glue dots or a similar archival-safe permanent adhesive made for paper. Next up, download the PDF file for the printable card and print it onto white card stock. Or you can bring the file to your local office supply or print shop and have them do the printing! The file includes a card with a white background and one with a pink background so you can pick the one you love best to gift your valentine. Once printed, trim to size using a paper cutter or craft knife and a metal straight edge. 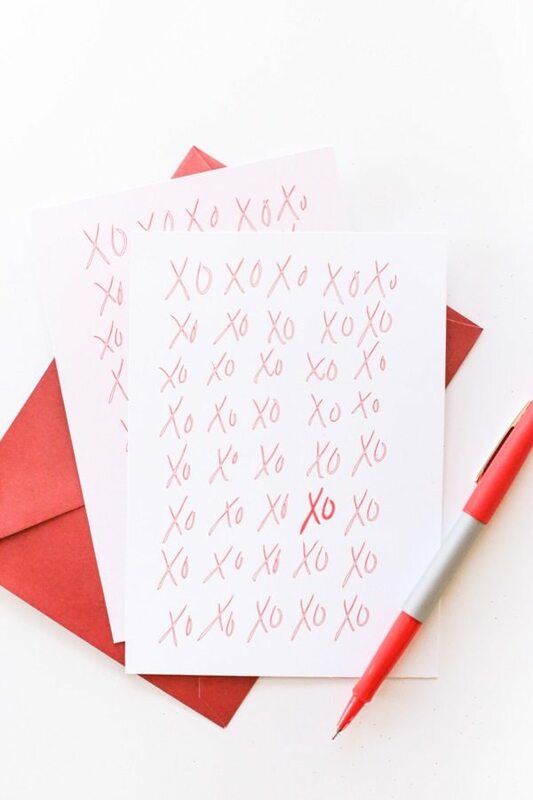 Finally, pen a sweet message on the reverse side of the card, tuck it into a pretty red or pink envelope and done! 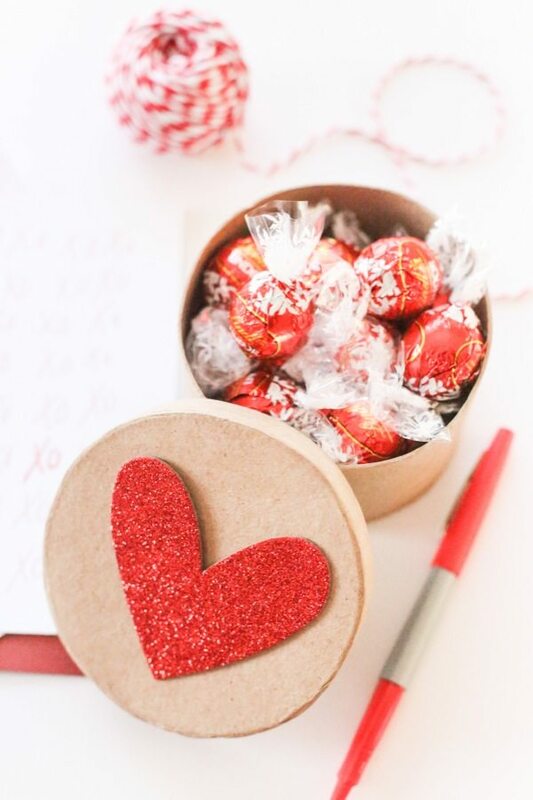 Don’t forget to stuff the box full of Lindt LINDOR milk chocolate truffles! They are my personal favorite and my mom used to include them with my Valentine’s Day gift every year when I was a kid. They just don’t make truffles any better in my book (which probably has something to do with the creamy, smooth melting center) and your valentine deserves the best, so there’s that. Also, the pretty red packaging makes for a pretty perfect Valentine’s Day gift, don’t you think? The traditional Valentine’s Day box of chocolates has never looked or tasted so good! 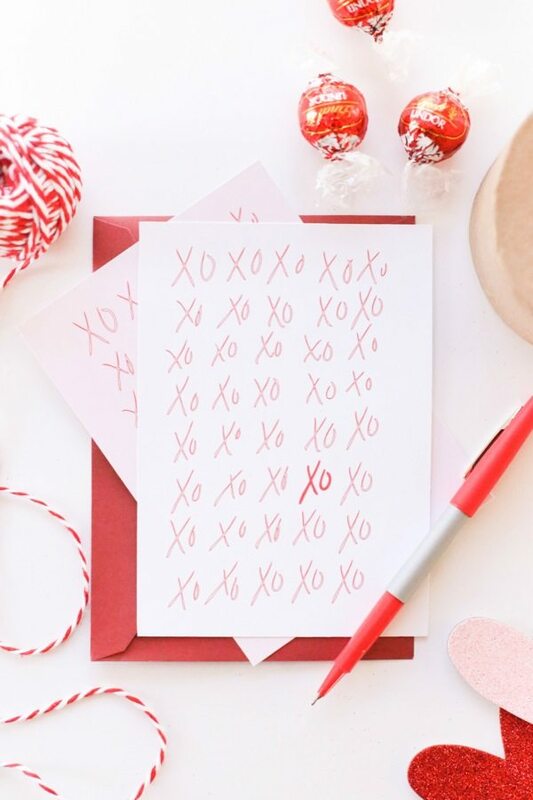 I’m pretty sure all of my favorite gifts to give or receive involve chocolate in some capacity, but especially on a day that’s really quite synonymous with chocolate, you absolutely can’t go wrong with taking a few minutes to make one or a few of these pretty little chocolate box valentines this year. It takes chocolate-giving to a whole new level that feels special and personal, which is what a day designed for celebrating love is all about. This post was sponsored by Lindt. Read more about our editorial policies.